Numerous studies have yielded inconclusive results regarding the relationship between anti-apoptotic protein Bcl-2 expression and the sensitivity to chemotherapy in the patients with breast cancer. The purpose of the current study was therefore to elaborate their relationship. A total of 23 previously published eligible studies involving 2,467 cases were identified and included in this meta-analysis. Negative Bcl-2 expression was associated with good chemotherapy response in breast cancer patients (total objective response [OR]: risk ratio [RR] = 1.16, 95% confidence interval [CI] = 1.02-1.32, p = 0.026; total complete response [CR]: RR = 1.67, 95% CI = 1.24-2.24, p = 0.001; pathological CR: RR = 1.92, 95% CI = 1.38-2.69, p < 0.001). In further stratified analyses, this association remained for sub-groups of response in neoadjuvant chemotherapy setting, especially pathological CR. Besides, negative Bcl-2 expression was significantly associated with good OR and pathological CR in anthracycline-based chemotherapy subgroup. Furthermore, there were significant links between negative Bcl-2 expression and taxane-based chemotherapy with pathological CR, but not OR. The results of the present meta-analysis suggest that Bcl-2 expression is a predictive factor for chemotherapy sensitivity in breast cancer patients. They could also potentially benefit further clinical treatment for breast cancers. Breast cancer remains a major medical problem in women despite of dramatic advances in clinical and research have been achieved in the last three decades. Chemotherapies including neoadjuvant chemotherapy, adjuvant chemotherapy, and systemic chemotherapy, are widely used in breast cancer treatment. However, whether a patient responds to chemotherapy remains unpredictable, a proportion of patients fail to respond to chemotherapy, or even progress during therapy. Because the information on the drug sensitivity of tumors is often unknown before treatment initiation, many patients are treated, but only a few are benefited. Thus, predicting how well a patient will respond to chemotherapy and the risk of relapse is essential in deciding the best treatment option for each individual patient. Multiple biomarkers with potential predictive value have been evaluated in breast cancer, which may be useful for identifying those patients who would benefit from certain chemotherapy. Conventional chemotherapeutic agents generally kill via the mitochondrial apoptotic pathway. Mitochondrial priming is controlled by the Bcl-2 family of proteins[2, 3]. This family consists of both pro-apoptotic and anti-apoptotic members. If pro-apoptotic members overwhelm the anti-apoptotic members, the threshold of death is crossed and the cell dies through apoptosis. The ability of Bcl-2 to prevent apoptosis is antagonized by the pro-apoptotic members of the Bcl-2 family. Cytotoxic chemo-agents that promote apoptosis through DNA damage or microtubule disruption can be inhibited by Bcl-2 expression. An in vitro study showed that over-expression of Bcl-2 increased the resistance of MCF-7 cells to doxorubicin, and this resistance was positively correlated with Bcl-2expression level of individual MCF/ Bcl-2 clones. Studies demonstrated that Bcl-2 inhibition through targeted-RNAi knockdown or Bcl-2 antagonist (ABT-737) increased cellular response to daunorubicin, etoposide, and mitoxantrone in the THP-1 and OCI-AML3 cell lines, and targeting of the proteins Bcl-2 and Bcl-xL with ABT-737 may reverse the acquired radioresistance of MDA-MB-231R cells in vitro and in vivo. Although there are now a large number of studies focusing on Bcl-2 expression in breast cancers, however, the association between its expression and chemosensitivity was not conclusive, mostly due to the small sample size of each study. We therefore performed a meta-analysis of the value of Bcl-2 expression for predicting sensitivity to chemotherapy in breast cancer. PubMed, Embase, and Web of Science databases were searched (up to September 20, 2013) using the search terms: 'Bcl-2’, 'BCL2’, 'bcl’, 'bcl*’, 'B-cell CLL/lymphoma 2’, 'chemotherapy’ and 'breast cancer’. All potentially eligible studies were retrieved and their bibliographies were carefully scanned to identify other eligible studies. Additional studies were identified by a hand search of the references cited in the original studies. When multiple studies of the same patient population were identified, we included the published report with the largest sample size. Only studies published in English were included in this meta-analysis. 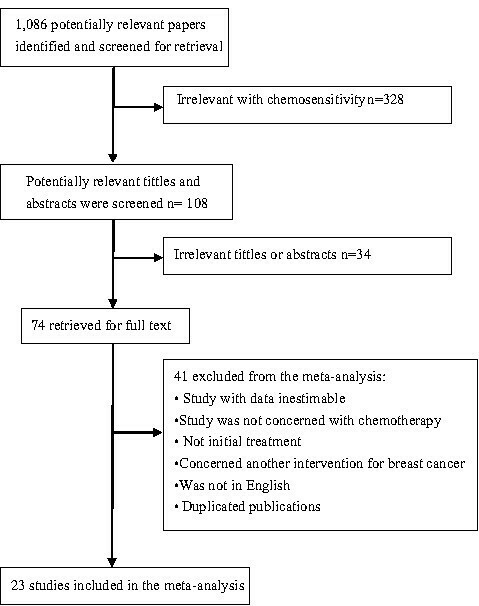 Studies included in this meta-analysis had to meet all of the following criteria: (a) evaluation of Bcl-2 expression for predicting the response to chemotherapy in breast cancer, (b) studies with data on initial treatment, excluding studies reporting relapsed disease or second line therapy, (c) described therapeutic response, (d) retrospective or prospective cohort study, (e) inclusion of sufficient data to allow the estimation of a risk ratio (RR) with 95% confidence intervals (95% CI), and (f) studies published in English. Letters to the editor, reviews, and articles published in books, or papers published in a language other than English were excluded. According to the inclusion criteria listed above, the following data were extracted for each study: the first author’s surname, publication year, country of origin, number of patients analyzed, types of measurement, and the treatment. Data on the main outcomes were entered in tables showing the response to chemotherapy with respect to Bcl-2 expression. Information was carefully and independently extracted from all eligible publications by two of the authors (Yang and Chen). Any disagreement between the researchers was resolved by discussions until a consensus was reached. If they failed to reach a consensus, a third investigator (Lu) was consulted to resolve the dispute. Response was defined as complete response (CR), partial response (PR), or objective response (OR) (OR = CR + PR). Non-response was defined as stable disease (SD) or progressive disease (PD), according to WHO criteria or RECIST (Response Evaluation Criteria in Solid Tumors) criteria. RR with 95% CIs was used to estimate the association between Bcl-2 expression and response to chemotherapy in breast cancer patients. Subgroup analyses were performed to evaluate the effects of neoadjuvant chemotherapy and different treatment regimens (anthracycline-based and taxane-based). Heterogeneity assumption was checked using the Q test, and a p value >0.10 indicated a lack of heterogeneity among studies. We also quantified the effect of heterogeneity using I2 = 100% × (Q - df)/Q. I2 values of <25% may be considered "low", values of about 50% may be considered "moderate" and values of >75% maybe considered "high". In the absence of statistical heterogeneity, a fixed effects model was employed (the Mantel–Haenszel method). If heterogeneity was present, a random effects model (DerSimonian–Laird method) was used to account for inter-study heterogeneity. Funnel plots and the Egger’s test were employed to estimate the possible publication bias. We also performed sensitivity analysis by omitting each study or specific studies to find potential outliers. Statistical analyses were conducted using Stata (version SE/10; StataCorp, College Station, TX). p values for all comparisons were two-tailed and statistical significance was defined as p < 0.05 for all tests, except those for heterogeneity. A total of 1,086 articles were retrieved by a literature search of the PubMed, Embase, and Web of Science databases, using different combinations of key terms. As indicated in the search flow diagram (Figure 1), 23 studies reported at least one of the outcomes of interest and were included in this meta-analysis[12–34]. The main features of these eligible studies are summarized in Table 1. The sample sizes in all the eligible studies ranged from 28–517 patients (median = 90 patients, mean = 107 patients, standard deviation [SD] =107). Overall, the eligible studies included a total of 2,467 patients. Nineteen of the studies were conducted in European or North American populations with mixed but mostly white participants (2,105 patients), whereas four were conducted in East Asian populations (362 patients).Data related to patients treated by neoadjuvant chemotherapy comprised 19 of the 23 breast cancer trials. Immunohistochemistry (IHC) techniques were used in all the trials to detect the expression of Bcl-2 protein. Various antibodies were used to assess Bcl-2 expression, and the cutoff in the number of positive cells defining a tumor with Bcl-2 overexpression varies from 5% to 50%, more than 10% for most studies (Table 1). Improving the quality of reports of meta-analyses of randomized controlled trials; the Quality of Reporting of Meta-Analyses (QUOROM) statement flow diagram. 5% or more tumor cells stained. NCT, neoadjuvant chemotherapy; IHC, immunohistochemistry; A, doxorubicin; E, epirubicin; D, docetaxel; P, paclitaxel; F, 5-fluorouracil; EC, epirubicin and cyclophosphamide; FEC, 5-fluorouracil, epirubicin, and cyclophosphamide; FAC, 5-fluorouracil, doxorubicin, and cyclophosphamide; CMF, cyclophosphamide, mitomycin C and 5-fluorouracil; AVCMF, doxorubicin, vincristine, cyclophosphamide, methotrexate and 5-fluorouracil; P-FEC, sequential paclitaxel and 5-FU/epirubicin/cyclophosphamide; FUMI regimen, 5-fluorouracil (1,000 mg/m2 on days 1 and 2) and mitomycin; PCb, paclitaxel + carboplatin; RT radiation therapy; ddAT, dose-dense (bi-weekly) doxorubicin and docetaxel; FLN, 5-fluorouracil + folinic acid + vinorelbine; D and MF docetaxel; docetaxel to sequential methotrexate and 5-fluorouracil;NR, not reported. Among the studies dealing with breast cancer patients with chemotherapy response, twenty-three studies involving 2,467 patients contributed to data on total OR (clinical OR + pathological OR). Negative Bcl-2 expression was significantly associated with improved total OR among patients with chemotherapy (RR = 1.16; 95% CI = 1.02–1.32; p = 0.026, Figure 2). Twelve studies involving 1,602 patients contributed to data on CR (pathological CR + clinical CR). Negative Bcl-2 expression was significantly associated with improved CR (RR = 1.67; 95% CI = 1.24–2.24; p = 0.001). Ten studies involving 1,285 patients contributed to data on total pathological CR. In fact, all these patients received neoadjuvant chemotherapy. 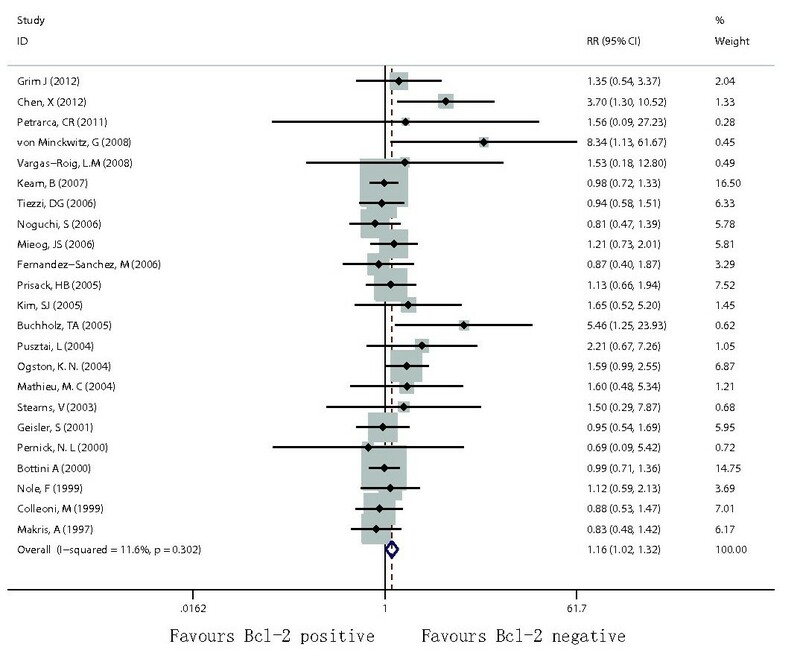 Negative Bcl-2 expression was significantly associated with improved pathological CR (RR = 1.92; 95% CI = 1.38–2.69; p < 0.001). Forest plots of RR were assessed for association between Bcl-2 and total OR among breast cancer patients treated with chemotherapy. Among the 23 studies, nineteen used neoadjuvant chemotherapy, one used first-line chemotherapy, one involving neoadjuvant and first-line chemotherapies, and one failed to report, we therefore calculated the associations with favorable responses to neoadjuvant chemotherapy. The results of subgroup analysis were presented in Table 2. 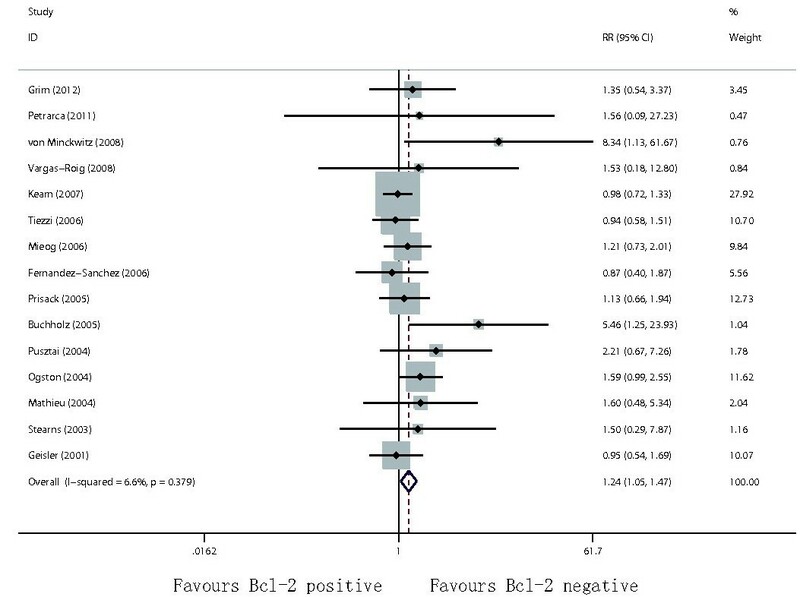 Negative Bcl-2 expression was significantly associated with increased total OR (RR = 1.19, 95% CI = 1.04–1.37, p = 0.014), CR (RR = 1.67; 95% CI = 1.24–2.24; p = 0.001), pathological CR (RR = 1.92; 95% CI = 1.38–2.69; p < 0.001, Figure 3) among patients treated with neoadjuvant chemotherapy. 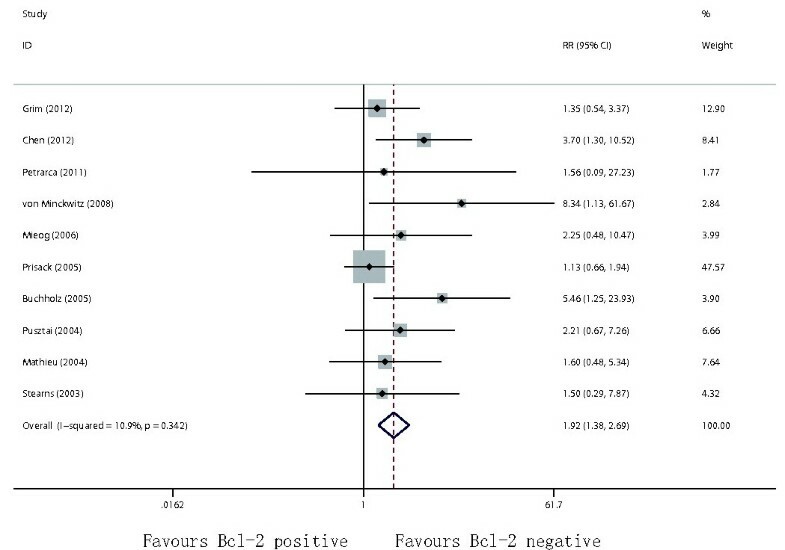 Forest plots of RR were assessed for association between Bcl-2 and pathological CR among breast cancer patients treated with neoadjuvant therapy. N, number of studies; Ph, p value of Q-test for heterogeneity. *The pooled RR was calculated using a fixed-effects model (the Mantel–Haenszel method) according to the heterogeneity. #The pooled RR was calculated using a random-effects model (the DerSimonian and Laird method) according to the heterogeneity. Subgroup analysis was performed when there were at least two studies in each subgroup. Bcl-2 expression has been used to evaluate associations with favorable responses to different treatment regimens of chemotherapy(either by anthracycline- or taxane-based). Among the 23 studies in the chemotherapy subgroup, fifteen used anthracycline-based neoadjuvant chemotherapy and eight used taxane-based neoadjuvant chemotherapy, while five used both anthracyclines and taxanes (Table 2). The results of the anthracycline- and taxane-based neoadjuvant chemotherapies were therefore calculated separately. No study contributed to data on clinical CR in the subgroup analysis. Negative Bcl-2 expression was associated with improved chemo-response in breast cancer patients who received anthracycline-based therapy (total OR: RR = 1.28, 95% CI = 1.01–1.43, p = 0.034, Figure 4; pathological CR: RR = 1.76, 95% CI = 1.24–2.51, p = 0.002). 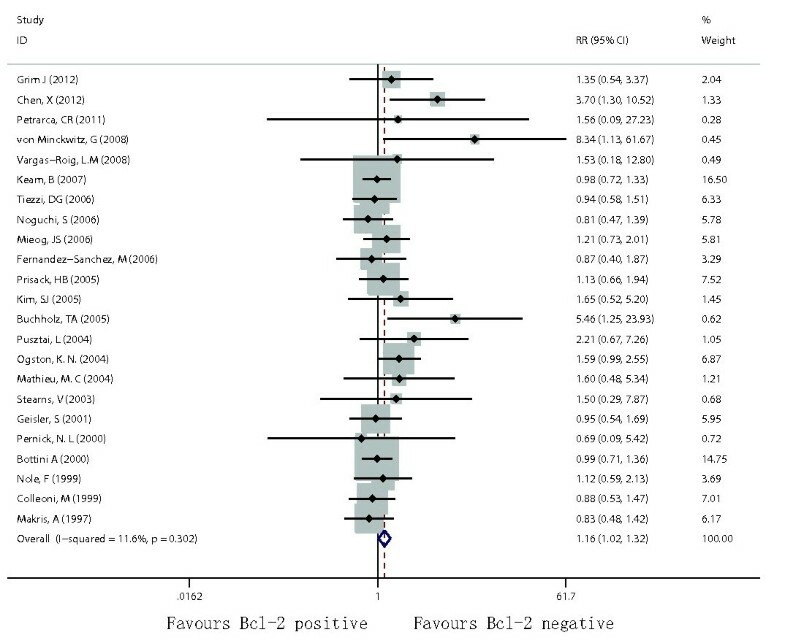 Negative Bcl-2 expression was significantly associated with increased pathological CR (RR = 2.11; 95% CI = 1.14–3.88; p = 0.017) among patients treated with taxane-based therapy, but not with total OR (RR = 1.37; 95% CI =0.88–2.14; p = 0.160). Forest plots of RR were assessed for the evaluation of total OR in anthracycline-based settings. Begg’s funnel plot and Egger’s test were used to estimate the publication bias of the included literatures. 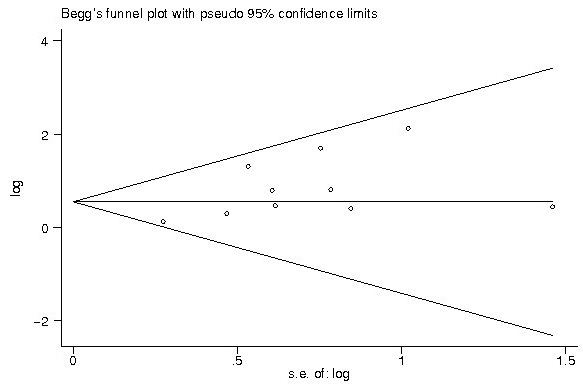 The shapes of the funnel plots showed no evidence of obvious asymmetry (Figures 5 and6), and Egger’s test indicated the absence of publication bias (p > 0.05). Moreover, sensitivity analysis was carried out to assess the influence of individual study on the summary effects. No individual study dominated this meta-analysis, and the removal of any single study had no significant effect on the overall conclusion (data not shown). 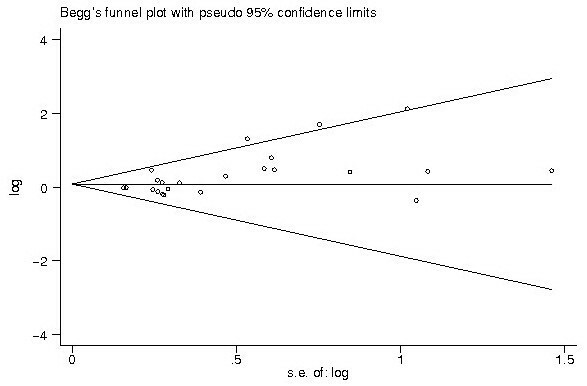 The funnel plot shows that there was no obvious indication of publication bias for the outcome of total OR. The funnel plot shows that there was no obvious indication of publication bias for the outcome of pathological CR among breast cancer patients treated with neoadjuvant therapy. Although there have been many attempts to correlate Bcl-2 status with chemosensitivity in breast cancer patients, the results have been controversial. Our systematic review of the literatures shows that negative Bcl-2 expression is a good prognostic factor for predicting sensitivity to chemotherapy of breast cancers. The analysis reveals similar features in different subgroups and clarifies the message of individual studies that are somewhat inconsistent. In our systematic review with meta-analysis, patients with Bcl-2-negative tumors had significantly better response to chemotherapy than those with Bcl-2-positive tumors. This observation is potentially important. The identification of independent predictive factor allows us to define high-risk patients for whom specific therapy may be designed or to introduce stratification in randomized trials. Furthermore, identifying and validating a predictive biomarker is of more than purely scientific interest because clinical Bcl-2 inhibition is now a practicable clinical approach. Recently, Abbott Laboratories has two drugs in clinical trials that directly target Bcl-2, ABT-263, and ABT-199[35–37]. Interestingly, we noticed that patients with Bcl-2-negative tumors were more likely to achieve a complete remission after neoadjuvant chemotherapy. Multiple clinical trials have shown that patients who achieved a pathological CR after neoadjuvant chemotherapy were associated with improved survival. Intensive researches have thus been focused on identification of “predictive markers” of chemotherapy sensitivity, especially those producing pathological CR. Our results indicated that Bcl-2 expression could potentially help to stratify patients in neoadjuvant chemotherapy. Notably, we found the correlation between Bcl-2 expression and the response to anthracycline-based chemotherapy. It is important to mention that Vo TT et al. found that Bcl-2 MOLM13 partial knockdown was associated with increased death by topoisomerase II inhibitors (etoposide, daunorubicin, and mitoxantrone) in proportion to the quality of the knockdown. A combination of the analysis of Bcl-2 expression and perhaps other variables (e.g., HER-2, hormone receptor, tumor size and histological subtype) may make it possible, to stratify chemotherapy sensitive subgroup of patients with advanced breast cancer. The decision to perform the meta-analysis was based on a prior methodological assessment of the publications. We have used a methodology similar to previous systematic reviews reported by our group on the treatment of breast cancer and rectal cancer after an adaptation to biological predictive factors such as p53. By comparing the scores of the studies where Bcl-2 was a significant predictive factor and those where it was not, we could identify differences, suggesting biases induced by trial methodology. Nevertheless, our approach does not eliminate all potential biases. First, the meta-analysis may have been influenced by publication bias, we limited the search to studies written in English, and we did not search conference proceedings and abstract books, which may have introduced publication bias to this meta-analysis. We tried to identify all relevant data and retrieve additional unpublished information, some missing data were, however, unavoidable. Second, the techniques used to identify overexpression of Bcl-2 status can also be a potential source of bias. The IHC used to reveal the Bcl-2 protein is not always performed with the same antibody. Moreover, the cutoff in the number of positive cells defining a tumour with Bcl-2 overexpression often varies according to the investigators, which may lead to biased conclusions. Third, although we made considerable efforts to standardize definitions, some variability in definitions of methods, measurements, and outcomes among studies was inevitable . Fourth, our analysis was observational in nature, and we therefore can’t exclude confounding as a potential explanation of the observed results. Despite these limitations, this meta-analysis had several strengths. First, a substantial number of cases were pooled from different studies, and 2,467 subjects represents a sizeable number to significantly increase the statistical power of the analysis. Secondly, no publication biases were detected, indicating that the pooled results may be unbiased. This study is the first meta-analysis to assess the use of Bcl-2 expression for predicting the chemo-sensitivity of breast cancer patients. Our data support Bcl-2 expression as a useful predictive factor for assessing treatment response to chemotherapy in breast cancer patients. However, future properly designed prospective studies with large sample sizes and an appropriate statistical methodology including multivariate analysis are required to confirm our findings. Moreover, the interaction of this marker with other markers such as HER-2, hormone receptor, tumor size and histological subtype remains unknown and should be a matter for further investigation. Dong Yang, Min-Bin Chen contributed equally to this work. This work was supported by the Natural Science Foundation of Jiangsu Province (No. BK2010160, BK2011374) and the National Natural Science Foundation (No.81108676, 81101801). The funders had no role in study design, data collection and analysis, decision to publish, or preparation of the manuscript. DY, M-BC, P-HL contributed to the conception and design of the study, the analysis and interpretation of data, the revision of the article as well as final approval of the version to be submitted. LY, C-YL and L-QW. participated in the design of the study, performed the statistical analysis, searched and selected the trials, drafted and revised the article. All authors read and approved the final version of the manuscript.